Fiction – hardcover; Tinder Press; 288 pages; 2014. Review copy courtesy of the publisher. I do like a dark, disturbing novel, especially when the protagonist is guilty of a horrendous crime and tries to get away with it, so when I heard about Natalie Young’s Season to Taste or How to Eat Your Husband it seemed right up my street. A set of spoof recipe cards sent to me prior to the book’s release served to heighten my interest, so by the time I’d received a proof in the mail I was dying — pun fully intended — to read it. Alas, this is a classic case of a book not quite meeting my over-inflated expectations. Indeed, I’m struggling to comprehend all the hype around its publication, which I can only assume is based more on the stomach-churning subject matter — cannibalism — than the story itself, but others may beg to differ. 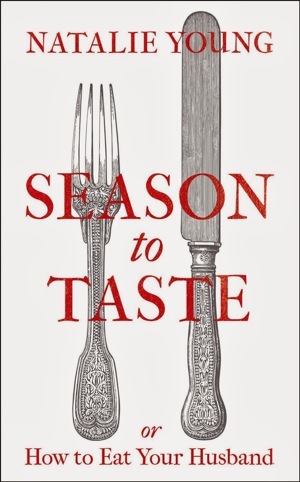 Season to Taste or How to Eat Your Husband tells the story of Lizzie Prain, billed as an ordinary housewife, who murders her husband in the garden by caving his head in with the back of a spade. To dispose of the body, she comes up with a rather unique solution: she butchers him into component body parts, bags these up, pops them in the freezer and then over the course of the entire novel eats him piece by piece. To make the meat palatable, she concocts various recipes, thereby turning her late husband into an extended gourmet meal, which she expects will last a month. All the while, she’s conscious that once she’s eaten Jacob, she will be free to move to Scotland and live the life she’s always wanted to lead. Sounds intriguing, if slightly sickening, doesn’t it? But that’s basically where the intrigue ends, because not much else happens in this book. The story really is as basic as Lizzie killing her husband and then turning cannibal to get rid of the evidence. My problem with Season to Taste or How to Eat Your Husband does not lie in the flat, emotionless prose style, which I quite liked, nor in its structure, told in part by Tom, one of Lizzie’s neighbours, and dotted with Lizzie’s own notes to herself (“81. Your husband’s flesh will now be in your mouth and oesophagus, your gullet, stomach and intestines.”) And I’m not too fussed that we never find out Lizzie’s real motivations for killing her husband, although there are hints he was controlling and she was co-dependent. My problem lies in the relentless descriptions of cannibalism — a reader can only tolerate so many macabre pages of cooking and eating body parts before they begin to feel ill — and the overwhelming dullness of the lead character. Indeed, part-way through this novel I began to wonder if Lizzie might be slightly dim-witted or perhaps have a learning disability, because she was just so dreary and uninteresting. Instead of wanting to cheer her on — aka Tom Ripley in Patricia Highsmith’s The Talented Mr Ripley or Matt in Henry Sutton’s Get Me Out of Here — I found myself simply not caring about her. And the meaning is… ? Of course, reading a novel like this I couldn’t help but try to figure out what the author was trying to say about Lizzie. Was there a deeper meaning to all this butchery and blood and gruesomeness? The blurb on my proof copy bills it as a novel about the end of a marriage, but it’s not really about a marriage at all, because we only ever see things through Lizzie’s eyes and Jacob feels too one-dimensional for the reader to take any pleasure in his demise. My theory is that the story is a metaphor for creativity, because one of Jacob’s criticisms of Lizzie is that she lacks imagination. What better way, then, to show him he’s wrong than to use all her creative faculties to get rid of his body by cooking and eating him? That, I dare say, shows one hell of an imagination! I’ve started seeing this all over the blogosphere and, while I’m not tempted to read it for a moment, I am intrigued to read the different types of review it has received. Yours far and away the least positive I’ve seen, but also the one which makes the most sense to me! I confess, the premise is fascinating and the recipe cards a very clever marketing tool. It does seem the way of things these days … original marketing leads to high volume quick sales but so often the work does not follow through. Precisely why I refuse to purchase a book by succumbing to clever promotion until I’ve had a chance to read some reviews from people I trust. So thanks again for another thoughtful review. I’ve recently read two very positive (raving) reviews of this book which usually prompts me to put a book on my wish list but I haven’t put this one on it and, now I have read your review and know how similar our tastes are, I’m glad I haven’t. I’m not really into gruesome and especially not gruesome without anything else to make it worthwhile. In the very first paragraph the author refers to “one and two pees” (rather than pennies and twopences, or coppers, or small change), a phrase that is to me like fingernails on a blackboard. A lousy reason for not wanting to read a book I know, but there you go. Plus, having recently read Cynan Jones’s beautiful and lyrical ‘The Dig’ I’ve had about as much blood and brutality as I can stomach for a while! However, I did buy Young’s first novel when it came out, and keep meaning to read it (it appeals to me a lot more that the new one), so maybe if I do get around to it (and like it) at some point I’ll want to pick up ‘Season to Taste’. This sounds like the book I would least like to read, thank you for the review as it has compunded my decision to not read the book. I enjoyed reading the book at the time, although I did realise it was far from perfect. I did think there were some neat (but gruesome) touches, but you’re right the characters being one-dimensional. Also, it’s not growing on me with distance at all, so if I was reviewing it now, a couple of weeks later, I wouldn’t be so bothered. I didn’t really enjoy it either. It was grim and just plain dull. Sounds like a situation where the author went for shock value but hadn’t enough skill to do much more than that. Not one I wil be wasting eye power on. I think that’s the key here: I don’t mind gruesome and grim, but when there’s nothing else to make it worthwhile it just becomes gruesome and grim for the sake of it. I know it’s a short book — and I did read the entire thing in a couple of days — but I didn’t gain anything from the book except an empty hollowness. Oh yes, referring to pence as “pees” got my back up, too, David. LOL. I wasn’t aware that Young had an earlier novel, but having read this one I’m not much in the mood to explore her back catalogue.